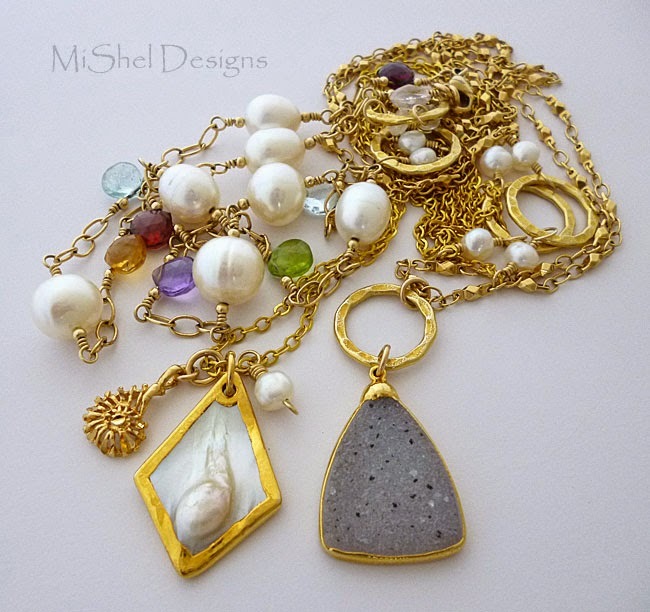 here on the MiShel Designs blog. 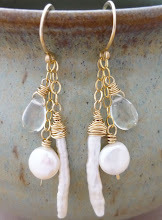 Create something using pearls. 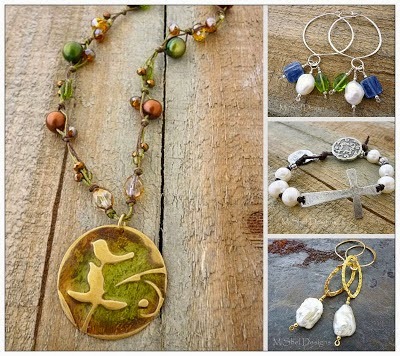 It doesn't have to be jewelry or bead related at all. It can be anything your little heart desires; from pearl encrusted stilettos, to a pearl laden writing journal or lamp shade, the choice is yours. There's been more travel this month than usual, some very sad moments of losing friends and other loved ones, an unusual amount of extra paper work for our business and school (yes, even though it's summer! ), appointments for senior photos, dental and doctor appointments, designing and ordering our 20th Wedding Anniversary rings (Mine's being created by the wonderful team over at Todd Reed in Colorado, and Mike's having our friend Steve help him craft his own - I can't wait to see them both!!) and all sorts of other 'home' stuff to manage. 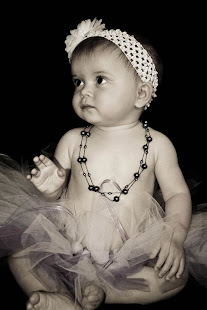 So, needless to say, I started to majorly stress out about the Pearls! Pearls!! Pearls!!! Blog Hop I decided to host this month. However, a friend nicely reminded me that although I'm hosting this hop, it shouldn't be stressful at all because it's just a "link up" type of hop. What's that mean you ask? It means that if you'd like to participate that all you have to do is come here on June 29th and 'Link Up' with us via the InLinkz link up tool that will be at the bottom of my blog post that morning. and join in the Pearl Fun! 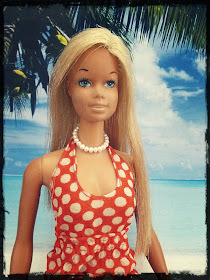 In the meantime this week, I am going to give you a couple of posts to wet your whistle on pearls - I mean, how could I knot. I mean not. LOL! First up, here's a couple of quick and easy reminders on how to care for and store your pearl jewelry. Always keep your pearl jewelry, whether it be real pearls or imitation pearls, out of the 'chemical baths' of perfume spraying, lotion lathering and hair spray fogging. Seriously. Be sure to use your lotion, your perfume and your hair spray BEFORE donning your pearls - and yes, that goes for pearl earrings as well gals! 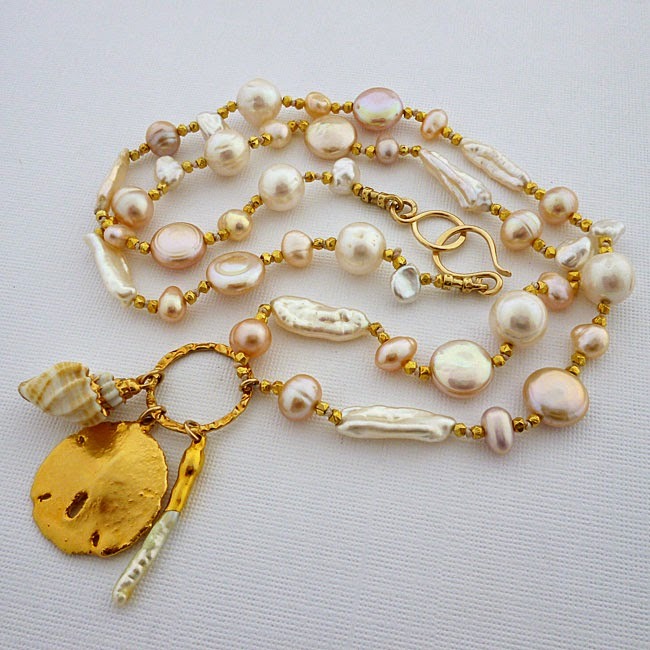 Never clean your pearls with liquid chemical jewelry cleaners. I did this once. 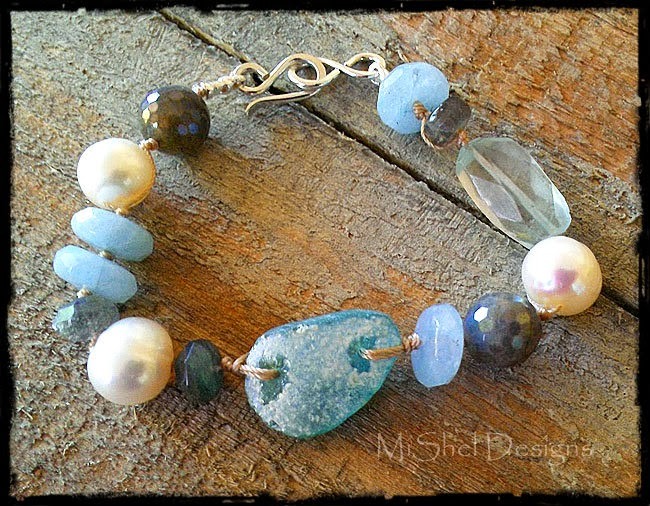 It was on some really nice Swarovski Crystal Pearl jewelry I created many years ago with sterling silver. I dunked the entire necklace into the little basket, put it in the jewelry cleaning liquid, sealed the lid and left it there for almost 15 minutes. When I came back and took out my beautiful Swarovski Crystal Pearl and Sterling Silver Necklace,...the silver was all shiny and gorgeous again, but the crystal pearls were, shall we say, a bit 'sticky'. I had thought, "I'm only dipping them for a brief moment, what could possibly harm them that quickly?" Well, DUH! It's a chemical that cleans,...deep cleans. And obviously eats away at certain substances,...like pearl coatings, plastics, pearl nacre, resins, the stabilizing materials in stabilized turquoise and other gemstones. So, my advice, "No chemical cleaners for your pearls, okay?" 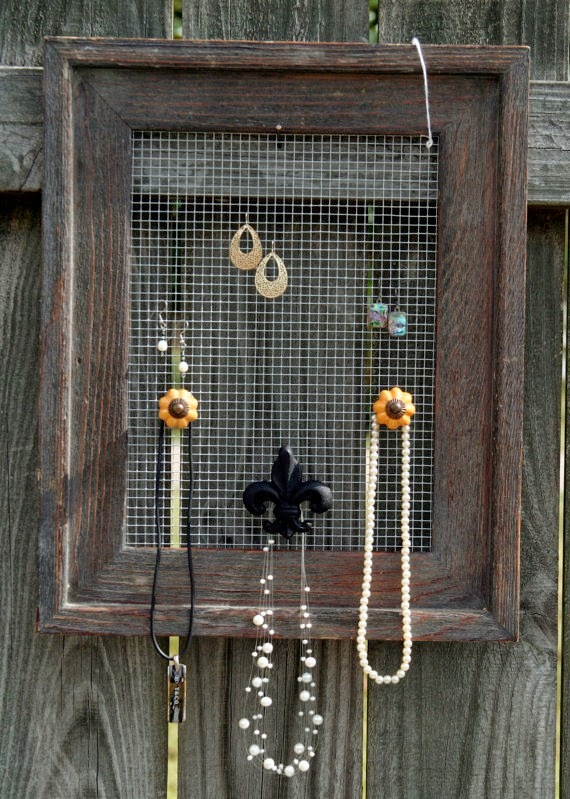 Also pearls, if strung on silk, nylon or other cording, should not be hung up in your jewelry box or from those cool DIY jewelry displays made out of a old picture frames and vintage drawer hardware or hooks. Nope. 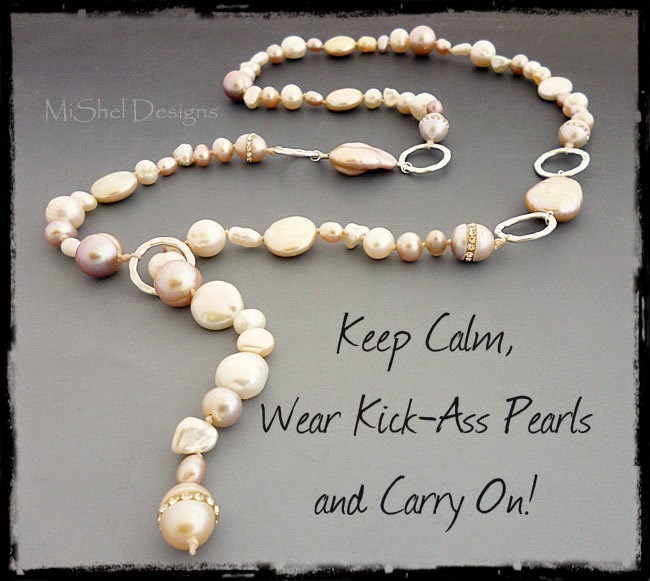 It looks really cool indeed, but it stretches the cord more quickly than normal wear and tear, thus leading to having your pearls restrung sooner than is actually needed. Ideally, it's best to store your pearls in a flat box - not a zippy bag or sealed plastic container as they need to breathe - with a nice soft jewelry cloth around them. I've used antique hankies to store mine in and to wipe them clean (you'd be amazed at the damage oils from your own skin can do over time) before I put them away. And, I feel good that my antique handkerchiefs are getting used and not just stored in a drawer somewhere. Okay - that's about it for today. Thank you for the great tips and I'll see you on the 29th! Looking forward to the hop! And happy to see that you're taking the advice of a good friend and not stressing!